I fly all the time, and the first word that I think of when I fly is “safety”. 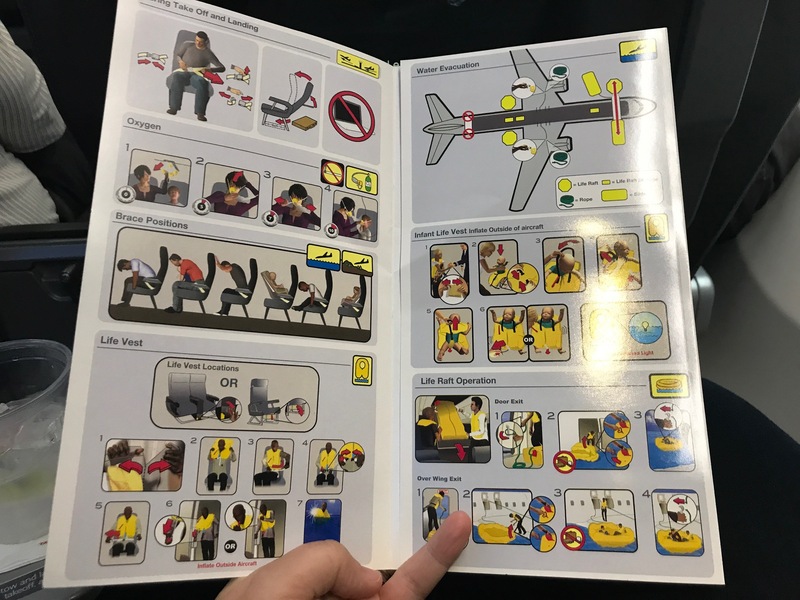 There definitely is a culture and focus that as a passenger I feel, and every time I fly I note how many similarities there are between aquatic safety and aviation safety. I considered whether guests or members who visited my waterpark or pool thought of the word “safety” first, and I bet they probably didn’t…they probably thought more about “fun” or “experience”. Now, don’t get me wrong…I think “fun” and “experience” are important words…but I don’t think they are more important than safety. On average, every year there are over 3,500 people who experience a fatal unintentional drowning (non-boating related) in the United States alone*. Aviation safety has a much better track record, “Nobody died in a crash of a United States-certificated scheduled airline operating anywhere in the world in 2016.”** I started to think if there were some lessons to be learned, so I began to look deeper into the details of aviation safety and noted some takeaways that I think we can apply to our aquatics operations to improve or refresh our approach to safety. 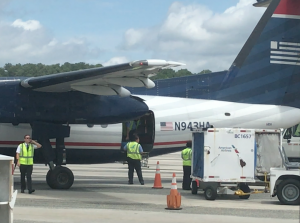 The airlines don’t care how many times you have flown before, or if you have already heard their safety spiel that day 7 times…you are going to hear it again. There is no way to get out of it, and passengers know this. They don’t ask to be excluded, it is a part of the culture, the system, and the environment. The plane isn’t allowed to take off until these messages of safety have been communicated. I could probably recite the safety messages without any prompts at this point, and that probably isn’t a bad thing, right?! I have always thought I wished this is something that aquatic operations would do. I picture groups of people in a holding area before entering a pool or waterpark watching a short safety video…every time they enter. I know it wouldn’t be super easy logistically, but I think it would be worth it. What if every person could pretty much recite from memory your safety messages?! I always laugh when the flight attendants show everyone physically how to buckle and unbuckle their lap belts. Seems common sense to me, but they know that is the first basic safety concept that applies to every single person on the plane. Sometimes as operators I think we may assume that people know the basics of aquatic safety, but I think that may be a poor assumption. Common sense isn’t so common when you are in a new or unfamiliar environment. We would probably be better off if we assumed everyone visiting our facility had never been to or seen a pool before. Think about how different your approach to operations would be. 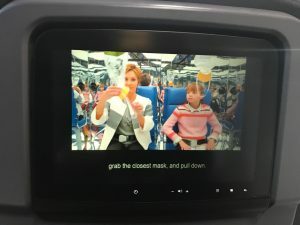 If you listen closely and look around, you can tell they have learned from prior mistakes or dare I say dumb things that passengers may have done before. There are signs telling you not to flush random objects down the toilet, signs telling you not to mess with the smoke detectors along with taped and numbered seals, they tell you to look behind you for your closest exit…I could go on, but the idea is when someone makes a mistake they then try to warn others to not do the same mistake again. Now, I understand…if we put a sign up for every odd thing that happened we may have so much signage up that it would look ridiculous and never be read, but I think we could do a better job of evaluating our individual facility trends and near misses to see if we could better educate or warn our guests. 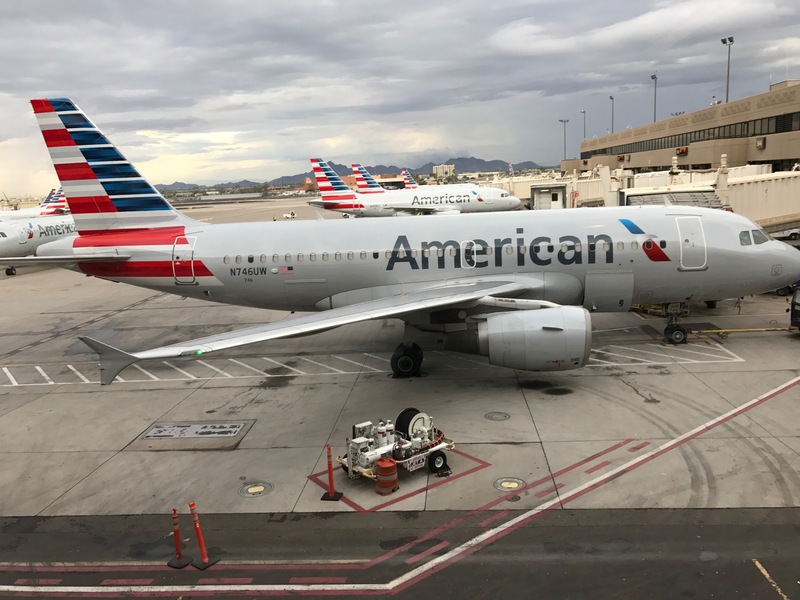 So often, I will talk with operators who bring up an issue and say, we see that “all the time”…well if that is the case I think we should file those actions with the smoke detector education of the airlines and start doing something about it! Everywhere you look in a plane there are warning signs and reminders about safety…under the seat…lifejacket pull tab, in the seat pocket….safety brochures sticking out, above icons and safety messaging, in the lavatory…safety messages and indicator lights, on the floor…exit path lighting. You can’t look in any direction without being reminded that you as a passenger have a part in safety. They layer on verbal repeating messages, have trained flight attendants to enforce rules. They aren’t afraid of laying it on thick! I don’t think there is any such thing as overdoing safety in their book, and I totally respect that. In aquatics, I think we are starting to understand layers, but I think we could be more strategic about how we layer. So often I see signage that looks more like a commercial than an intent to warn or educate someone, or facilities that are so afraid to make signage big enough so anyone can read it, or repeated in a way where everyone will be guaranteed walk by it. We should be proud of our layers and see if we could sit at a point in our facility and look around to be constantly reminded of our safety messaging. I was exiting a plane after a particularly not smooth landing, and we were standing on the jet bridge waiting for our gate checked luggage. One of the pilots entered the area and a fellow passenger commented, “Nice landing” in a joking kind of way…the pilot stopped and said, “Well, you can’t win them all, but you are safe.” I thought that was a telling attitude. 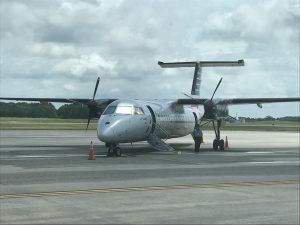 The pilot went on to explain the challenge with landing at the airport we are at along with some weather factors that made the landing not as smooth as every passenger hops for. He walked away saying, “Wasn’t perfect, but you are safe.” The goal was safety, bottom line. It didn’t matter that the landing was a little bouncy as long as everyone was safe. So often, I think operators get sucked into trying for perfection, rather than focusing on safety. Sometimes it is hard to look at risk in a real way through the lens of perfection, trust me…I’m a recovering perfectionist. Safe doesn’t mean you give out zero band-aids, or all of your rescues are textbook…in fact, it doesn’t mean you may never have a drowning event or someone who is injured, sometimes things happen. But if we are focused on safety first, we are focused on continual learning and the big picture of risk prevention. Perfection is not a realistic expectation, and one I think we need to give ourselves more grace on…we are human. We are expected to be reasonable…. not perfect, and safe is more important than perfect. If you have ever watched an incoming and outgoing pilot crew, they perform a “walk around” of the airplane when they are taking over the aircraft, and an outgoing “walk around” when they are leaving the aircraft. During their walk around they inspect the aircraft, looking for any damage or anything abnormal, and making sure they feel comfortable about flying that aircraft. It was explained to me, by a random pilot I struck up a conversation with, that this walk around was more than just a quick look, it was a “transfer of ownership”. This process reminded me of a pro-active lifeguard rotation. When a lifeguard rotation occurs, so often we see rotations completed very quickly, haphazardly, and with the intent just to switch positions, or with lifeguards just going through the motions. I think we need to focus on presenting rotations as a transfer of ownership, instead of just a transfer of position. Lifeguards should approach walking all around their zone, just like a pilot physically walks around the aircraft, inspecting everyone in the water and the water itself to ensure it is free and clear of any problems. Likewise, the outgoing lifeguard should do the same. A pro-active rotation is not about putting on a show, or making the lifeguard do more work…It is done right and looks different when the lifeguards understand the why behind it…we are transferring ownership from one pilot to the next, or one lifeguard to the next. 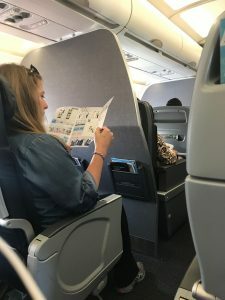 I was recently on a flight out of Phoenix, and I noticed the flight attendants were whispering, making phone calls and on a mission of some sorts during the boarding process. Come to find out they were calling their Supervisor to have an intoxicated male adult removed from the flight. The Supervisor, when she approached the lead flight attendant to ask him about the situation, she told him that they had two options, to keep the drunk guy in his seat or to remove him. The flight attendant immediately said, “I want him off this flight, it isn’t worth it.” This man smelled like alcohol and was sitting in his seat, he wasn’t belligerent or loud, but he was an identified risk that the flight attendants just weren’t worth taking a risk on. Sometimes in aquatics, we aren’t so quick to remove risky people. We do a pretty decent job of removing risky guest behaviors, but we don’t quite do the same with employees. Now, please don’t misinterpret…I am all for coaching and teaching employees, but sometimes there is an employee who is a risk to our operation and who needs to be transferred to another department or needs to find another job. There is probably one person who came to mind immediately when you read that last sentence…yup, that one! 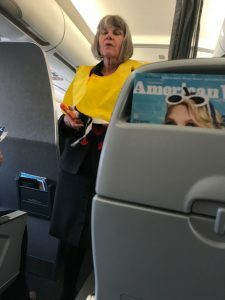 Just like the flight attendant, sometimes the risk isn’t worth it, and no amount of coaching is going to help. Unfortunately, for lifeguards, we just can’t take that risk sometimes. If I don’t trust you to save my life or save my kids lives…you are a risk that I need to remove. 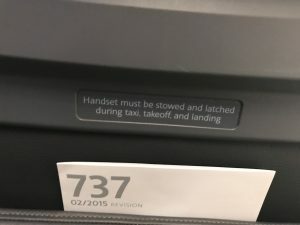 I was sitting in an aisle seat, 7D to be exact. There happened to be an off-duty pilot sitting in the window seat with another passenger seated in between us. When the seat belt safety messages began, the guy next to me attempted to fasten his belt…but was unsuccessful. He tried repeatedly, but it just wasn’t latching. Eventually, the off-duty pilot at the window started to help and he was also unsuccessful. 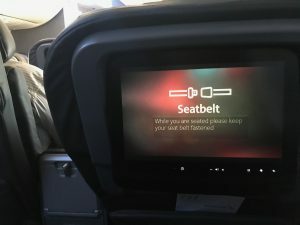 The off-duty pilot knew this was a critical safety element and he rang his call button to get the flight attendant out of his seat while announcing that if the belt couldn’t be fixed we wouldn’t be able to take off. Fortunately, the flight attendant was able to make the belt latch by simply flipping it over. Apparently, the lap belts in a bulkhead row had an airbag on them and needed to be facing outward, who knew? I didn’t, the guy in the middle seat didn’t, the off-duty pilot didn’t, but the flight attendant knew! A little basic detail, but he was on it. He knew the area of his responsibility, down to which way the belt needs to face, something, not even a pilot knew. This situation made me think about mastering the details in our own individual roles and being masters of our domains as operators. The details matter and keep people safe, so continue learning and asking questions to expand your knowledge. Even the pilot learned something new that day!